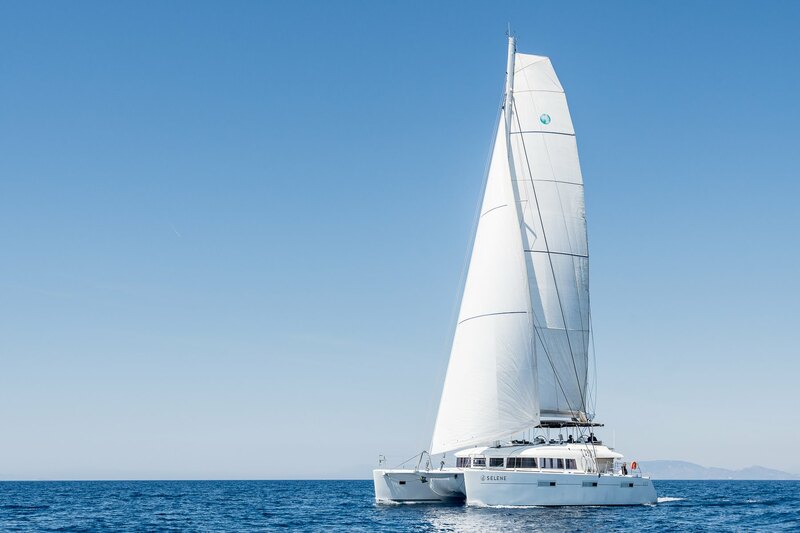 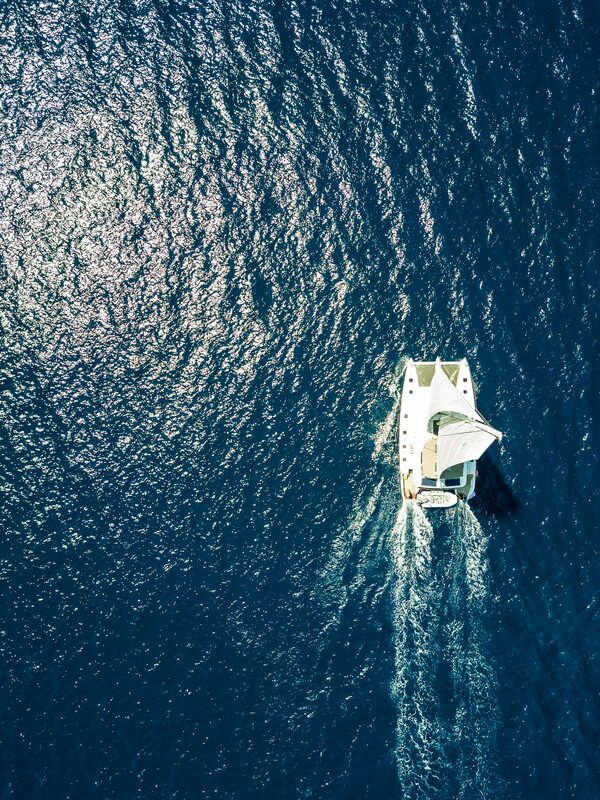 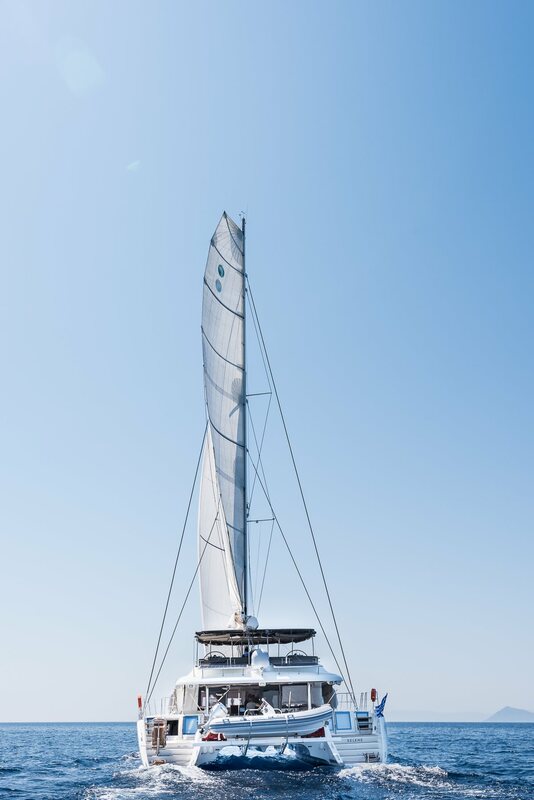 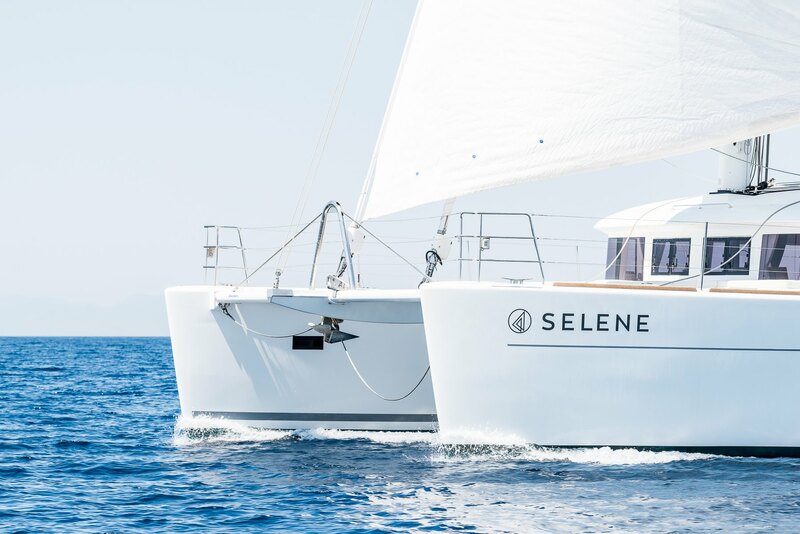 SELENE is a luxury sailing catamaran built by the Lagoon shipyard and launched in 2015. 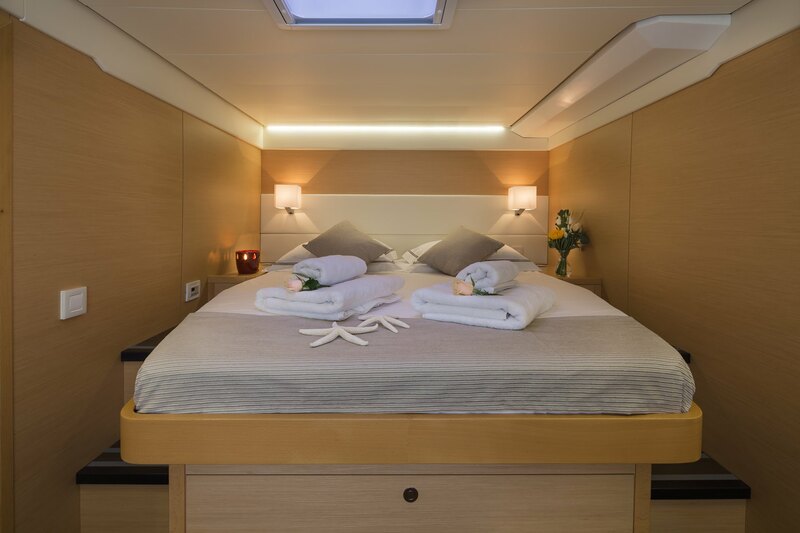 She was refitted in 2018 and measures 18.90m (62’), offering accommodation for up to ten guests in five cabins. 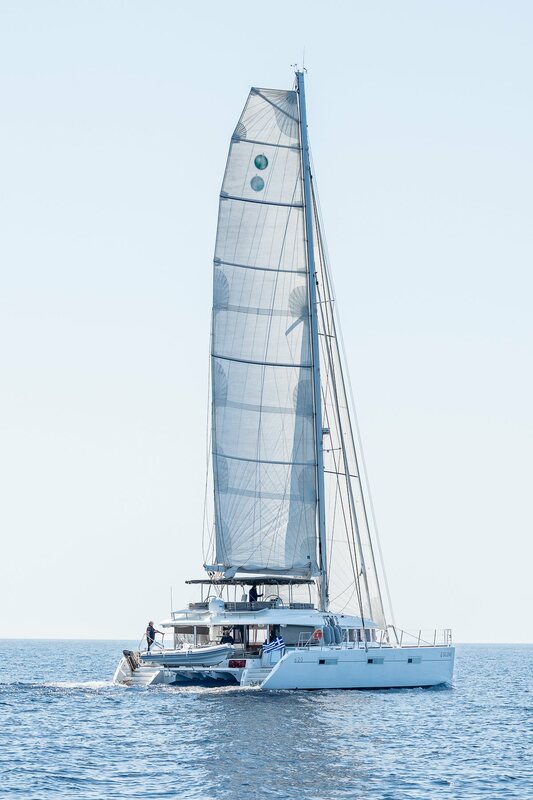 She has a crew of three on board. 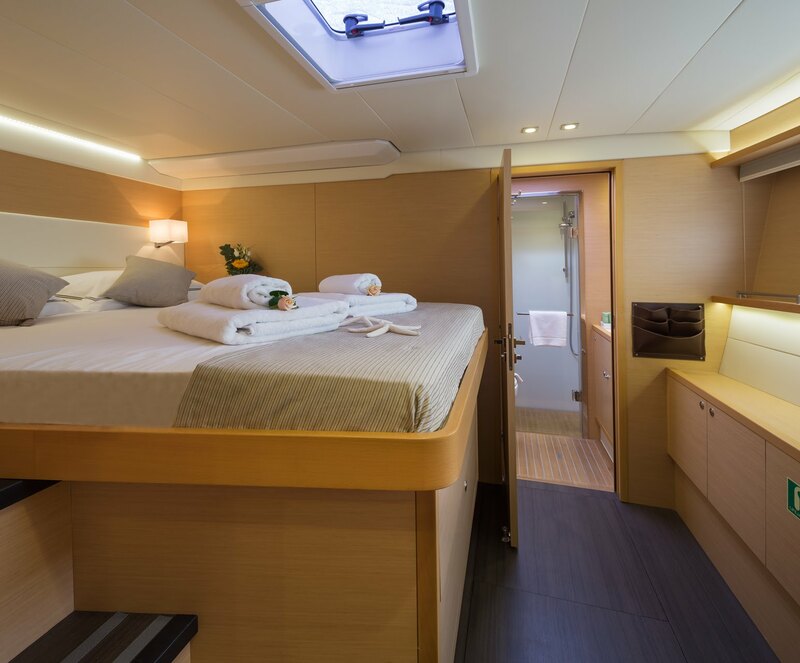 The main deck aft cockpit can become an extension of the salon by opening the massive glass sliding doors. 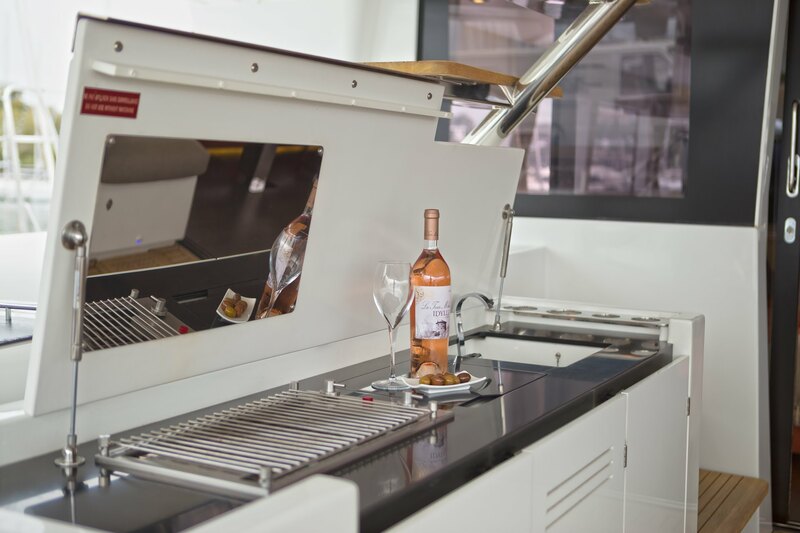 An L-shaped alfresco dining area and sunpad are on the starboard side, leaving the area opposite free for a wetbar and a staircase leading up to the flybridge. 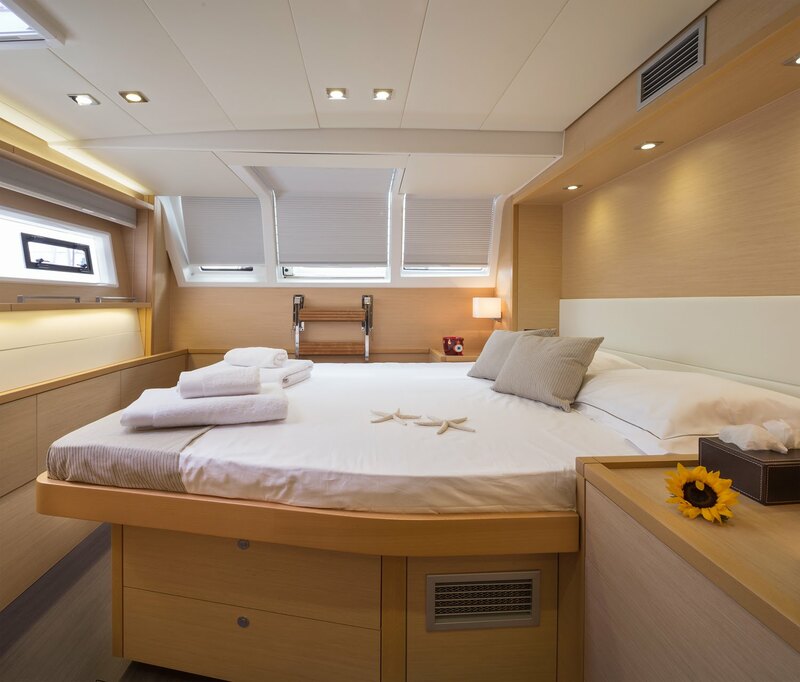 An additional sofa lines the stern and guests have effortless access to the water via the staircases down each hull. 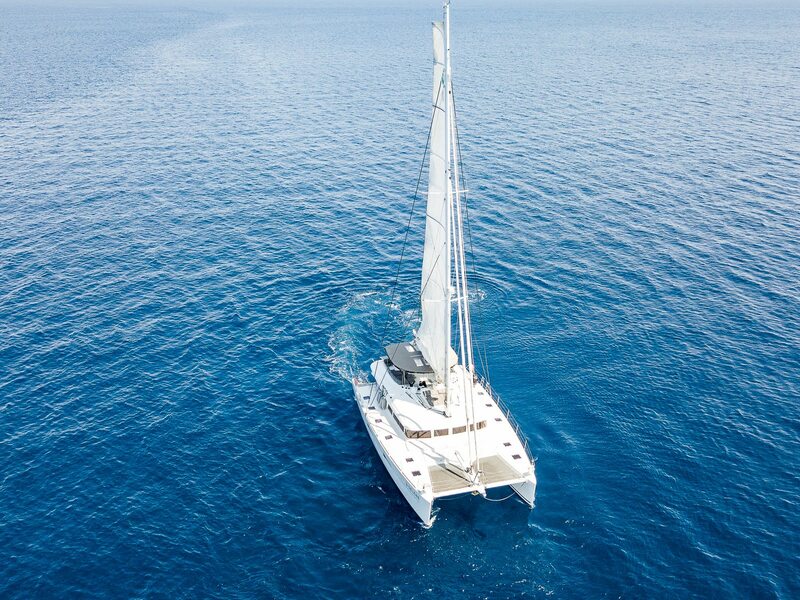 A swim platform lowers gently into the water and while cruising it is used to store the tender. 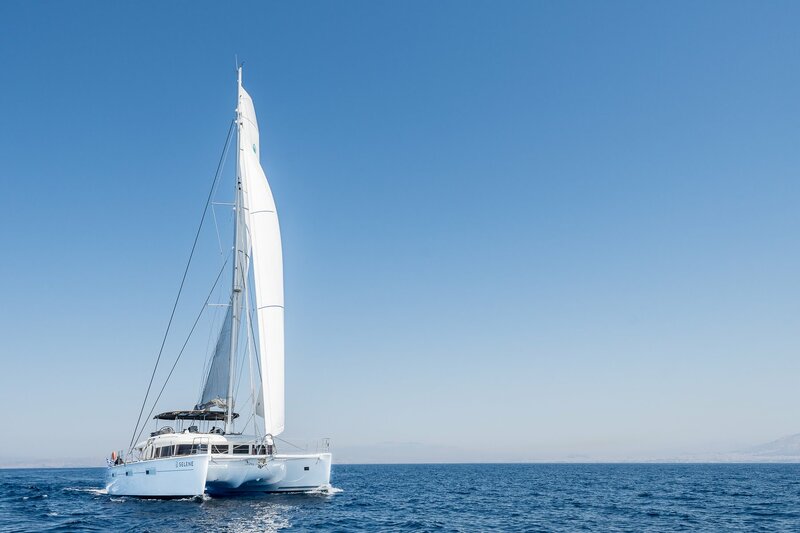 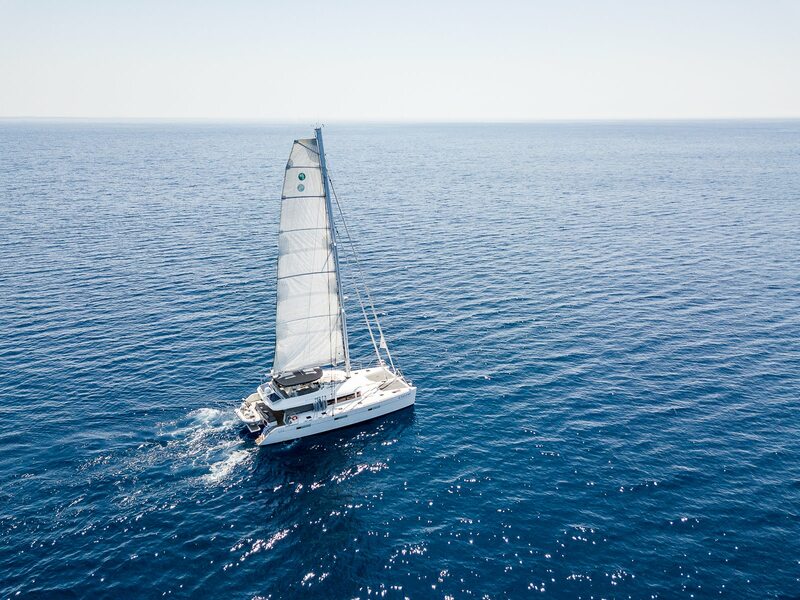 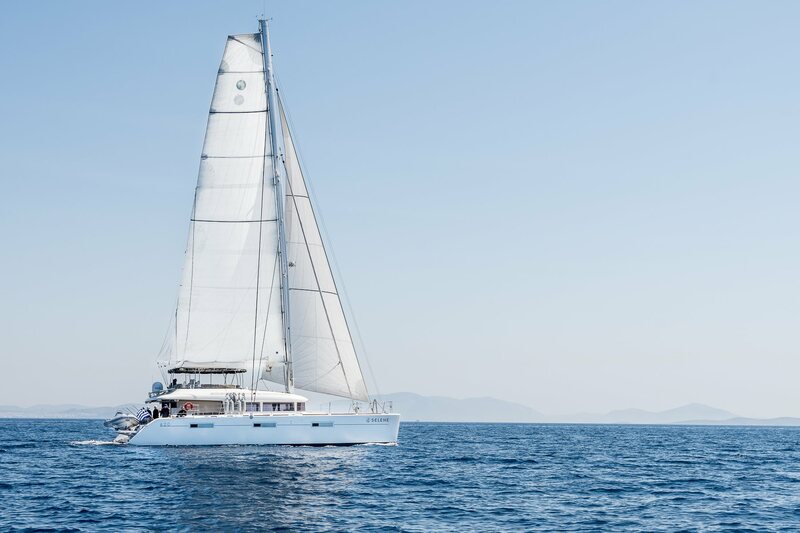 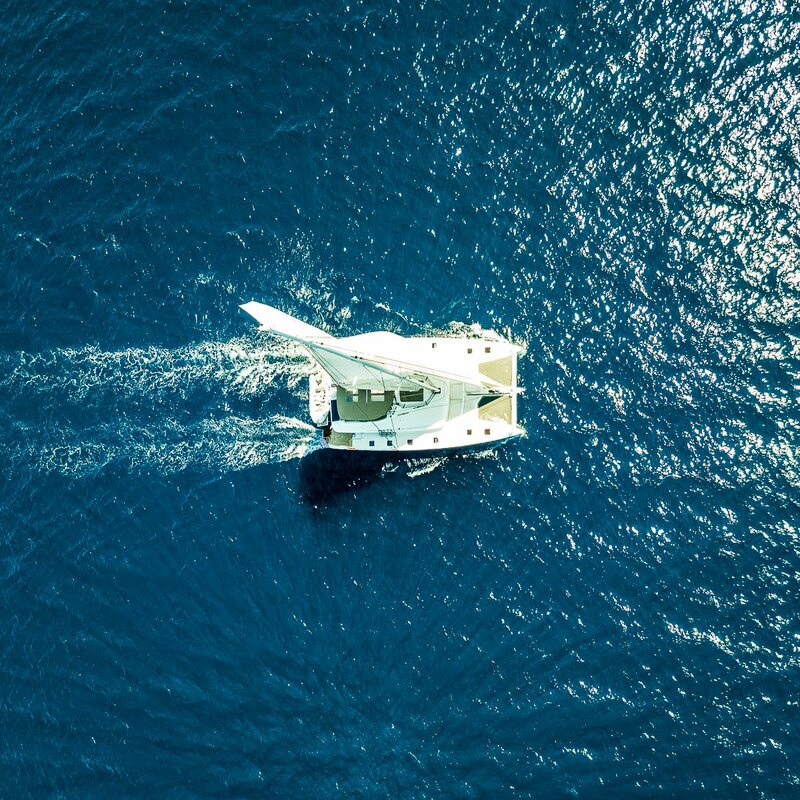 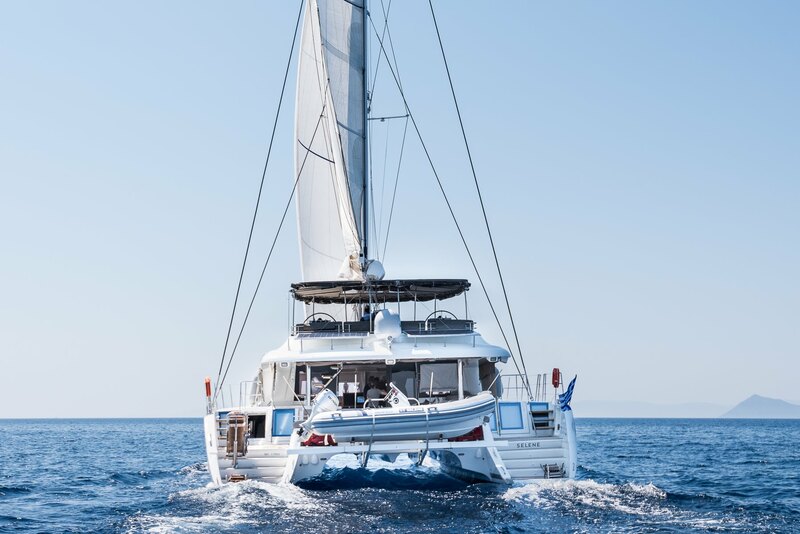 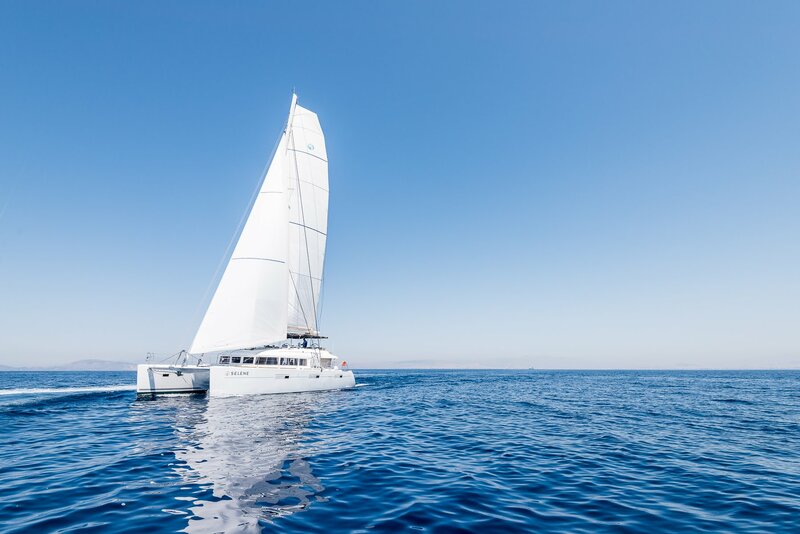 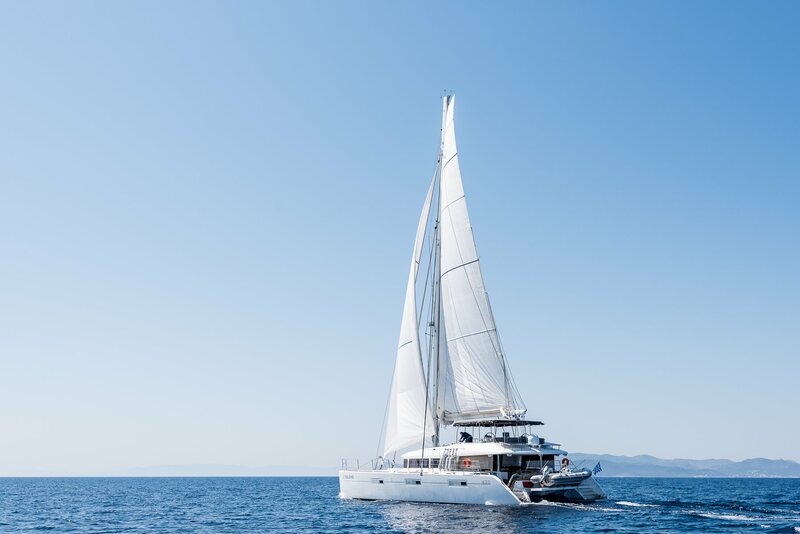 The foredeck provides plenty of space to dry off with sunpads spread horizontally in front to the helm station and two trampolines on the bow. 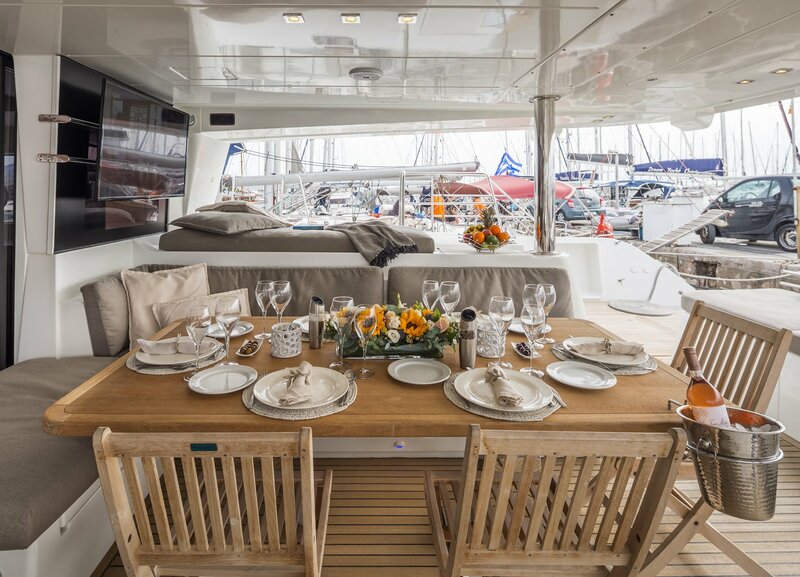 Up on the flybridge guests are treated to comfortable alfresco seating with a dining area, plus a sunpad in front of the helm station. 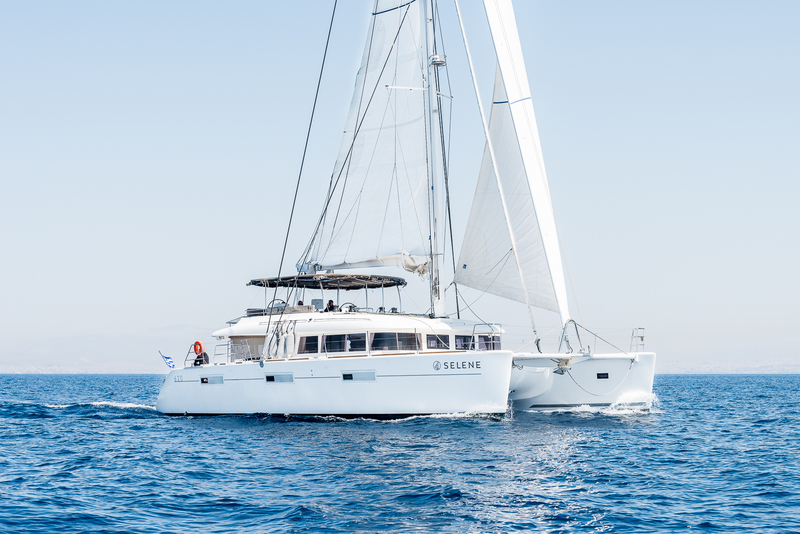 The port-side hull places a double cabin forward with another double cabin amidships, and the galley placed in the aft. 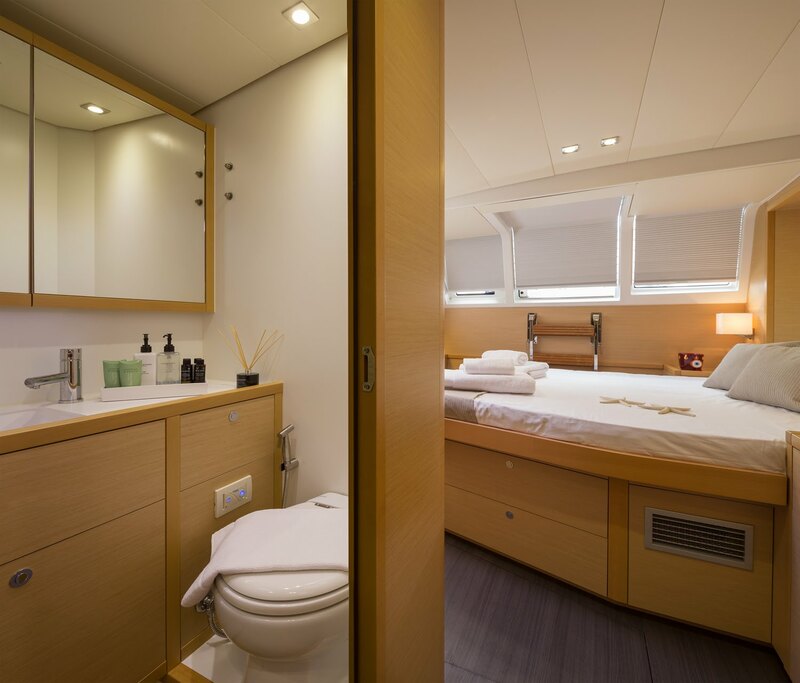 The starboard hull contains three double cabins, and both place the crew accommodation in the bows. 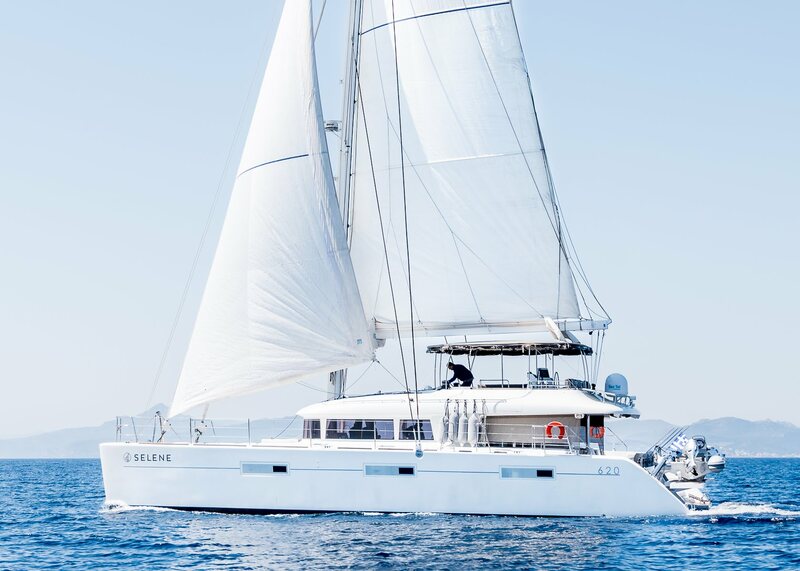 A forward and aft staircase on both sides connects to the salon, where guests have a choice of two seating areas surrounded by large windows and modern amenities. 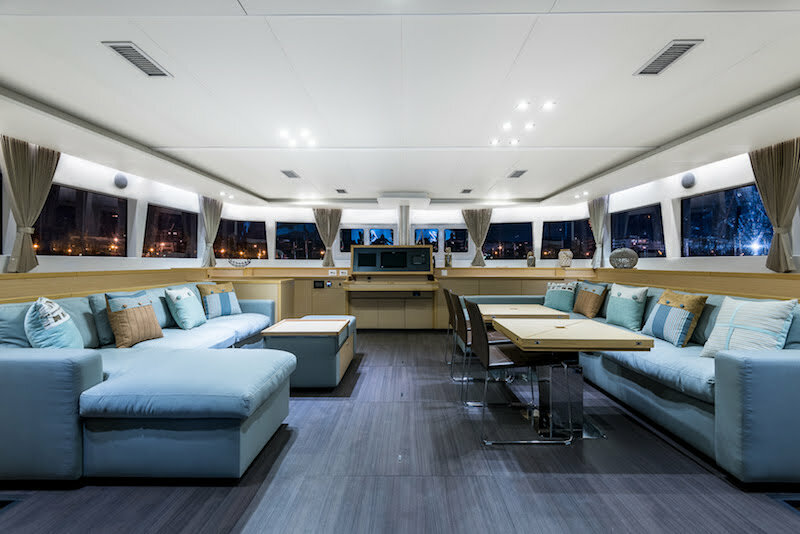 Both sofas use an L-shape to provide a day bed or seating around the coffee and elevated drinks tables, which can be extended to form a comfortable casual dining area. 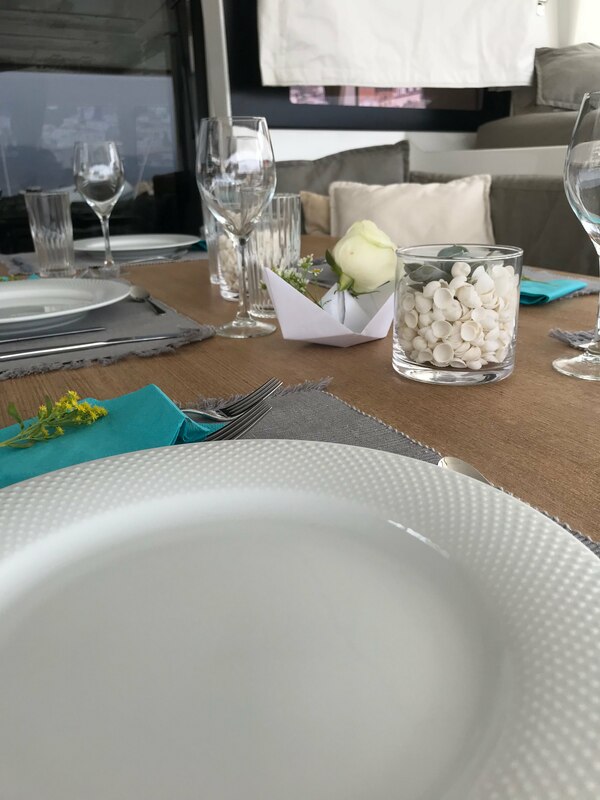 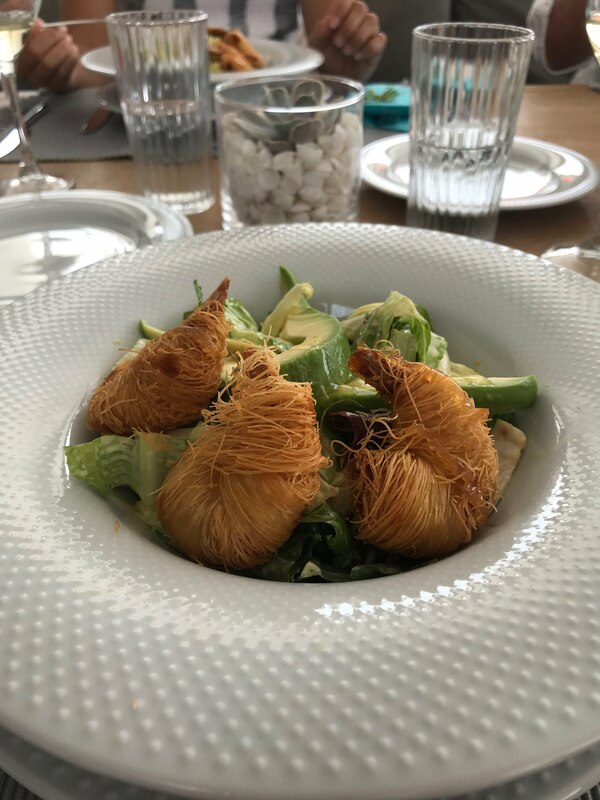 Curtains around the windows provide privacy and shade during the daytime and for intimate evening dining. 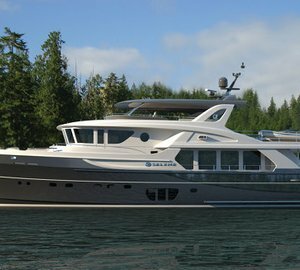 A pair of 150 HP generators allows for a cruising speed and a maximum speed of 10 knots. 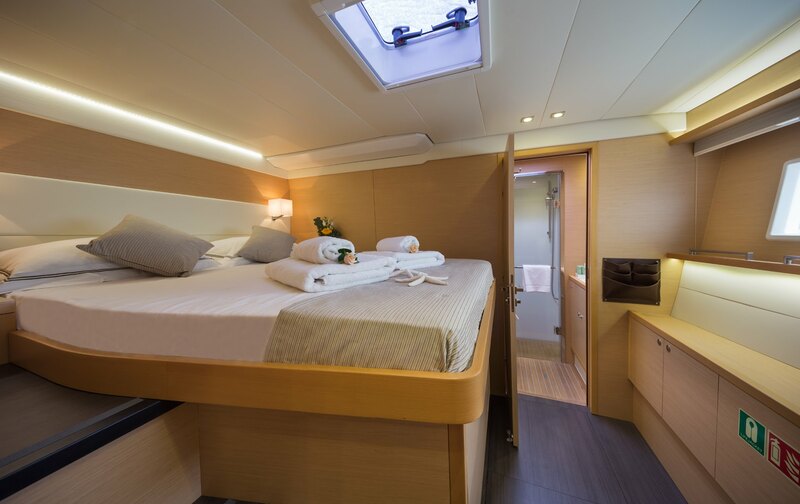 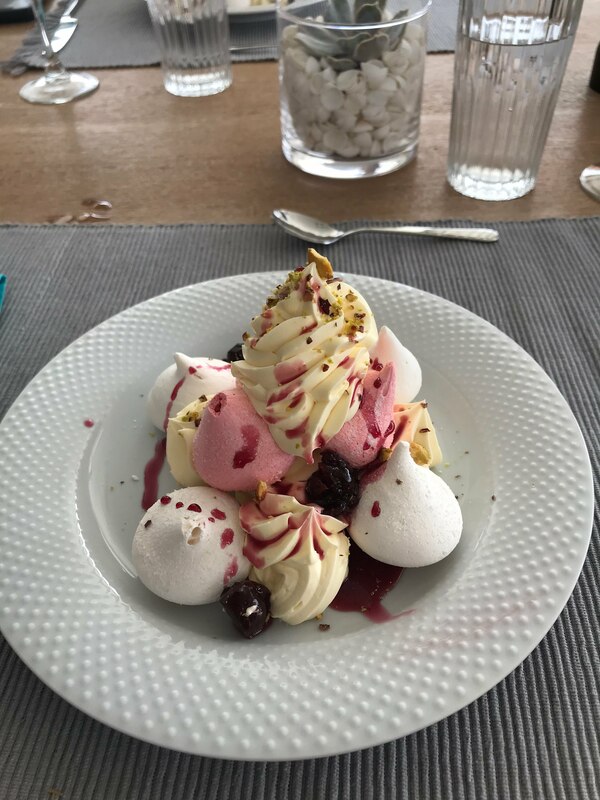 SELEN accommodated up to ten guests in five queen-bedded cabins. 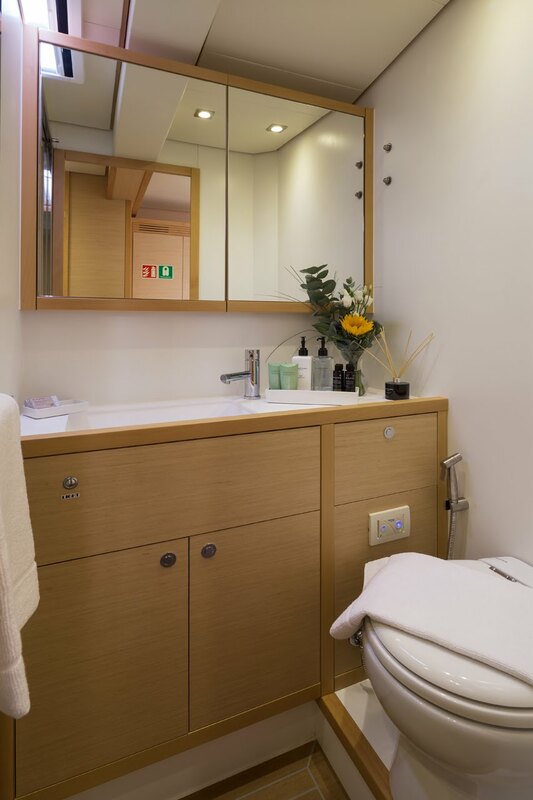 All cabins have their own ensuite bathroom facilities.